A group of rock-forming minerals found in Earth's crust. An abundant mineral in Earth's mantle. A constituent of many meteorites. Olivine in basalt: Lherzolite (a variety of peridotite) nodules in a xenolith collected from a basalt flow at Peridot Mesa, Arizona. These xenoliths often contain crystals of olivine with a color and clarity that is suitable for use as a peridot gemstone. This specimen is approximately 3 inches (7.6 centimeters) across. Olivine is the name of a group of rock-forming minerals that are typically found in mafic and ultramafic igneous rocks such as basalt, gabbro, dunite, diabase, and peridotite. They are usually green in color and have compositions that typically range between Mg2SiO4 and Fe2SiO4. Many people are familiar with olivine because it is the mineral of a very popular green gemstone known as peridot. Olivine gemstone: The gemstone known as peridot is a variety of olivine. 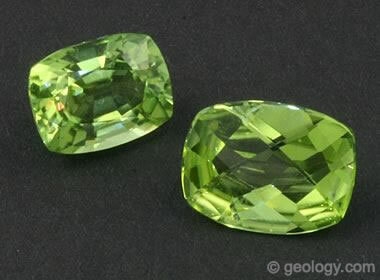 These two faceted stones are nice specimens of yellowish green peridot. The gem on the left is a 1.83 carat cushion cut peridot of about 8 x 6 millimeters from Myanmar. The gem on the right is a 1.96 carat cushion checkerboard cut peridot of about 10 x 8 millimeters from China. 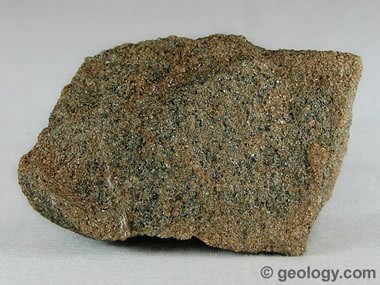 Photo copyright Geology.com. Most olivine found at Earth's surface is in dark-colored igneous rocks. It usually crystallizes in the presence of plagioclase and pyroxene to form gabbro or basalt. These types of rocks are most common at divergent plate boundaries and at hot spots within the centers of tectonic plates. Olivine has a very high crystallization temperature compared to other minerals. That makes it one of the first minerals to crystallize from a magma. During the slow cooling of a magma, crystals of olivine may form and then settle to the bottom of the magma chamber because of their relatively high density. This concentrated accumulation of olivine can result in the formation of olivine-rich rocks such as dunite in the lower parts of a magma chamber. Crystals of olivine are sometimes formed during the metamorphism of a dolomitic limestone or dolomite. The dolomite contributes magnesium, and silica is obtained from quartz and other impurities in the limestone. When olivine is metamorphosed, it is transformed into serpentine. Olivine is one of the first minerals to be altered by weathering. Because it is so easily altered by weathering, olivine is not a common mineral in sedimentary rocks and is only an abundant constituent of sand or sediment when the deposit is very close to the source. 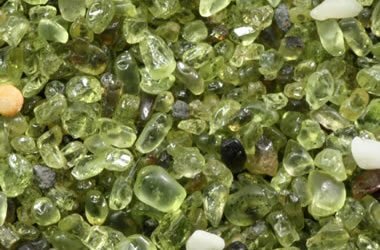 Olivine sand: Green olivine sand from Papakolea Beach, Hawaii. The white grains are coral fragments, and the gray-black grains are pieces of basalt. 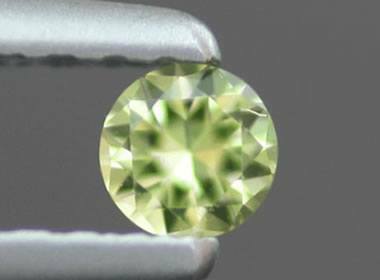 If you think the grains have a "gemmy" appearance, olivine is the mineral name of a gemstone known as "peridot." The width of this view is about 10 millimeters. Photograph by Siim Sepp, used here under a Creative Commons License. Olivine is the name given to a group of silicate minerals that have a generalized chemical composition of A2SiO4. In that generalized composition, "A" is usually Mg or Fe, but in unusual situations can be Ca, Mn, or Ni. The chemical composition of most olivine falls somewhere between pure forsterite (Mg2SiO4) and pure fayalite (Fe2SiO4). In that series, Mg and Fe can substitute freely for one another in the mineral's atomic structure - in any ratio. This type of continuous compositional variation is known as a "solid solution" and is represented in a chemical formula as (Mg,Fe)2SiO4. The name "olivine" is used instead of "forsterite" or "fayalite" because a chemical analysis or other detailed testing is needed to determine which one is dominant - if either is dominant. The name "olivine" serves as a quick, convenient, and inexpensive way to put a name on the material. A list of the more common olivine minerals and their composition is given in the table below. Olivine receives its name from its usual olive-green color. Many geology students remember the color of olivine by using a rhyme: "olivine is green." That rhyme is true with most classroom specimens; however, there are rare iron-rich olivines (fayalites) that are brownish in color. Olivine: Olivine from Mitchell County, North Carolina. Specimen is approximately 3 inches (7.6 centimeters) across. Olivine is thought to be an important mineral in Earth's mantle. Its presence as a mantle mineral has been inferred by a change in the behavior of seismic waves as they cross the Moho - the boundary between Earth's crust and mantle. The presence of olivine in Earth's interior is also confirmed by the presence of olivine in xenoliths, which are thought to be pieces of the upper mantle delivered to Earth's surface in the magmas of deep-source volcanic eruptions. 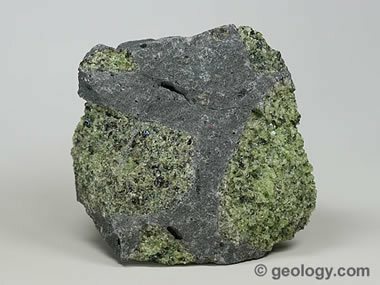 Olivine is also an abundant mineral in the lower portion of many ophiolites. These are slabs of oceanic crust (with part of the upper mantle attached) that have been thrust up onto an island or a continent. Chemical Composition Typically (Mg, Fe)2SiO4. Ca, Mn, and Ni rarely occupy the Mg and Fe positions. Olivine in pallasite: A part slice of the Esquel pallasite from Chubut, Argentina. The large, colorful, oblong olivine crystals are typical of this meteorite. Note the way in which crystals near the rough (natural) edge have turned orange and yellow due to terrestrial weathering, while the crystals nearer to the center of the original mass have retained their true olive green color. Photograph by Geoffrey Notkin, copyright Aerolite Meteorites, used with permission. Olivine is usually green in color but can also be yellow-green, greenish yellow, or brown. It is transparent to translucent with a glassy luster and a hardness between 6.5 and 7.0. 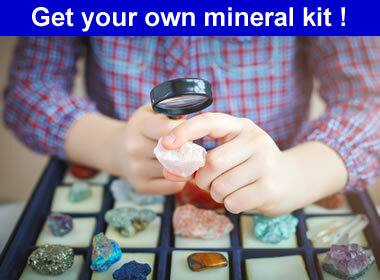 It is the only common igneous mineral with these properties. The properties of olivine are summarized in the table. Pallasite peridot: This is one of the most incredible gemstones. It is a piece of gem-quality olivine (peridot) from a pallasite meteorite, and it has been faceted into a wonderful little gemstone. This may be the most scarce gem material on Earth - but it actually originated in space. This stone is 2.85 millimeters in diameter and weighs about ten points. Photo by TheGemTrader.com. Olivine has been identified in a large number of stony and stony-iron meteorites. These meteorites are thought to have originated from the mantle of a rocky planet that used to occupy an orbit between Mars and Jupiter - or they might be from an asteroid that was large enough to have developed a differentiated internal structure consisting of a rock mantle and a metallic core. 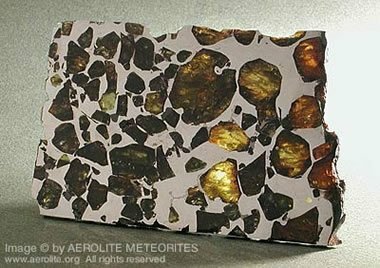 Pallasites are thought to represent the part of an asteroid or planet that was near the mantle-core boundary where rocky materials of the mantle were mixed with the metallic materials of the core. Pallasites typically have distinct crystals of olivine (usually fayalite) surrounded by a nickel-iron matrix. A photograph of a slice from a pallasite meteorite is shown on this page. 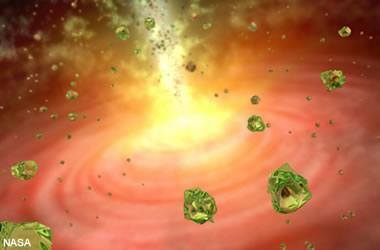 In 2011, NASA's Spitzer Space Telescope observed what is believed to have been tiny crystals of olivine falling like rain through the dusty cloud of gas of a developing star. This "olivine rain" was thought to have occurred as strong air currents lifted newly crystallized particles of olivine from the surface of the forming star, high into its atmosphere, and then dropped them when the currents lost their momentum. The result was a rain of glittering green olivine crystals. Olivine is a mineral that is not often used in industry. Most olivine is used in metallurgical processes as a slag conditioner. High-magnesium olivine (forsterite) is added to blast furnaces to remove impurities from steel and to form a slag. Olivine has also been used as a refractory material. It is used to make refractory brick and used as a casting sand. Both of these uses are in decline as alternative materials are less expensive and easier to obtain. 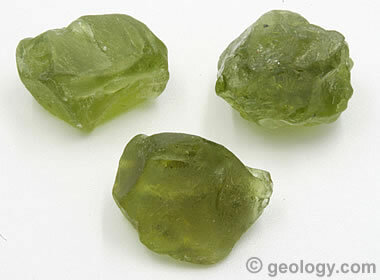 Olivine peridot rough: These three specimens are peridot, a gem variety of olivine, from a deposit in Arizona. At this deposit the olivine occurs in xenoliths that were erupted with a basalt flow. These specimens are approximately 12 millimeters across. Olivine is also the mineral of the gemstone known as "peridot." It is a yellow-green to green gemstone that is very popular in jewelry. Peridot serves as a birthstone for the month of August. The most valued colors are dark olive green and a bright lime green. These specimens are of the mineral forsterite because the iron-rich fayalite is usually a brownish, less desirable color. Much of the world's peridot used in mass-production jewelry is mined at the San Carlos Reservation in Arizona. There, a few basalt flows containing nodules of granular olivine are the source of the peridot. Most of the stones produced there are a few carats or less in size and often contain visible crystals of chromite or other minerals. They are cut in Asia and returned to the United States in commercial jewelry. Higher quality and larger peridot crystals are mined in Pakistan and Myanmar. There, crystals of olivine are found in metamorphic rocks. These are usually found in association with serpentine or dolomitic marble.